My latest foodie addiction is rosewater. Isn’t it the most heavenly ingredient? That heady, evocative perfume, mirrored so closely by that same wonderfully floral, fragrant flavour; it really is a magical and fantastical foodstuff that transports you instantly to star-swept scenes from the Arabian Nights. Ever since my husband bought some to create Yotam Ottolenghi’s sublime Roast Chicken with Saffron, Hazelnuts & Honey (inspired in turn by another culinary idol, Claudia Roden), I’ve been dreaming up different ways to feature rosewater in our cooking. This Raspberry, Strawberry and Rose Millefeuille was my first experiment and it was a brilliant success, even if I say so myself. Using ready-made puff pastry, it’s deceptively easy to make too, yet looks quite impressive when you serve it up for your eagerly awaiting guests. Line a large baking sheet with baking parchment and sprinkle with caster sugar. Lay the pastry onto the baking parchment, scatter with more sugar and cover with more parchment. Place another baking sheet on top, and bake in the oven for 20-30 minutes until the pastry is crisp and golden-brown. Leave to cool. For the filling, pour the cream and rosewater into a large bowl. Whisk until the cream forms soft peaks. 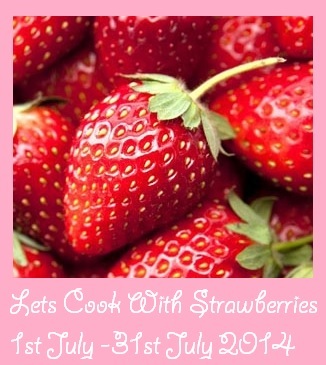 Fold the strawberries and raspberries into the cream and then place in the fridge. When the puff pastry is completely cool, use a sharp knife to trim the edges to form a tidy rectangle, and cut this into three equal rectangles. Place one rectangle of pastry on a plate and cover with half of the cream and fruit. Place the second layer of pastry on top and press down very gently. Top with the remaining cream mix and then place the final layer of pastry on top. Again press down gently squeeze the filling to the edges. Run a palette knife around the sides to level out the filling. Chill until ready to serve. 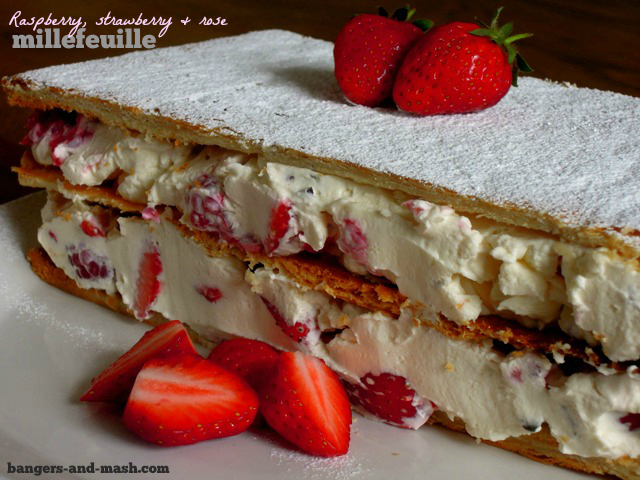 Liberally sprinkle the top with icing sugar and then very carefully cut the millefeuille into six elegant slices. As rosewater is the star ingredient in this millefeuille, I am entering it into July’s Alphabakes, hosted by The More than Occasional Baker and Caroline Makes, where the letter this month is R.
For obvious reasons, I’m also entering my dessert into Let’s Cook With Strawberries, hosted by Simply Sensational Food. And last not least, I’m entering it into Ren Behan’s Simple and in Season challenge, which is this month being hosted by My Custard Pie. For all the latest food blogger challenges, events, giveaways and competitions, do make sure you head over to the Food Blog Diary, overseen by Jac at Tinned Tomatoes, Karen at Lavender & Lovage and Stuart at Cakeyboi. It’s a brilliant resource and a vital tool for all food bloggers everywhere! this looks delicious! love the inclusion of the rosewater. definitely a recipe i will be trying… thanks for the inspiration. Thanks Thalia – the rosewater does indeed turn a lovely dessert into a very special dessert – in my eyes anyway! It looks wonderful Vanesther and such a great combination of flavours. This looks, and sounds, really wonderful! I wish I had some right now to gobble up. This looks amazing! I might have to try it this weekend. Vanesther this is such a professional and inviting picture-so beautifully executed. I know what you mean about the rose water, it is used a lot in Indian sweets and the smell always gives me impressions of luxury and pampering…just like your recipe. looks better than the ones in French patisseries. This is definitely an impressive dessert and I can’t believe how easy it is to make.I love the flavour combinations and I’m sure the rosewater elevates the berries.Thanks for entering AlphaBakes. How lovely are these?!!! 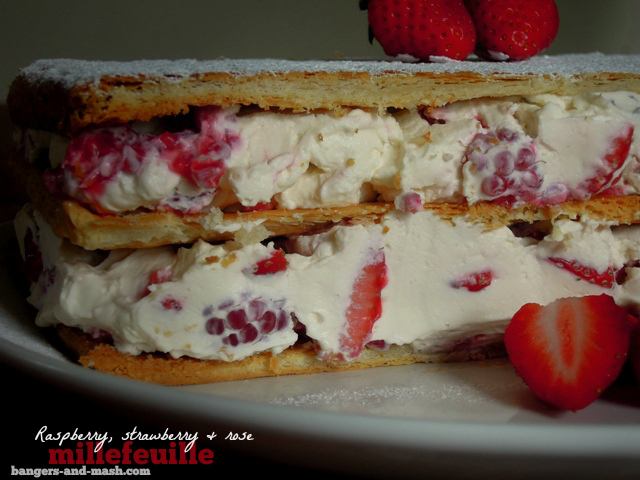 I love millefeuille, but have yet to try a GF version. These may just inspire me to have a go! Ooh let me know how you get on with a gluten-free version. Perhaps replace the puff pastry sheets with thin layers of crispy meringue? 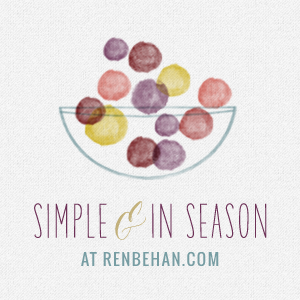 Thank you so much for entering Simple and in Season. That truly is a show stopper. So glad to have it in the round up (now published). Thanks Sally – it’s such an easy dish to create too! And wow – what a mammoth round-up for July’s Simple and in Season. You’ve done an amazing job – so many stunning summery entries.